Imagine sitting out watching your local cricket team in the grand final and all of a sudden the sky goes grey and the clouds start to rumble. What better way to keep your supporters dry and watching the game than with a promotional poncho. Great for outside events such as sports, music festivals, community events, corporate events and more, a promotional poncho can be easily stored in the car glove box, the sports bag or sold at the on-site canteen. Due to their compact size, they won’t take up much space, but your supporters and event attendees will be grateful on those drizzly days. Brand Republic has a range of ponchos suitable for any sporting organisation or community group. These affordable promotional options are a great branding opportunity and with a well designed logo, you can help your organisation stand out. If you’re looking for a product your supporters can purchase and then keep, leaving in the car glove box, sporting bag or camping kit, the Reusable Poncho in Zipper Pouch or Reusable Poncho in Poly Bag are a great choice. Both of these options come in a “one size fits most adults” sizing which means you can cover a large amount of your market. The zipper pouch option comes with a 4 colour print label as standard on the pouch while the poly bag option comes with a 4 colour print insert as standard. Both promotional ponchos are available in clear or yellow, are lightweight and come with a drawstring hood. Planning a community event where you’ll be providing free bags of items to attendees? The Disposable Poncho in Round Case is a great addition. Even if your attendees don’t used them on the day, they are great for leaving in the car or picnic set for those days when it starts to rain out of nowhere. 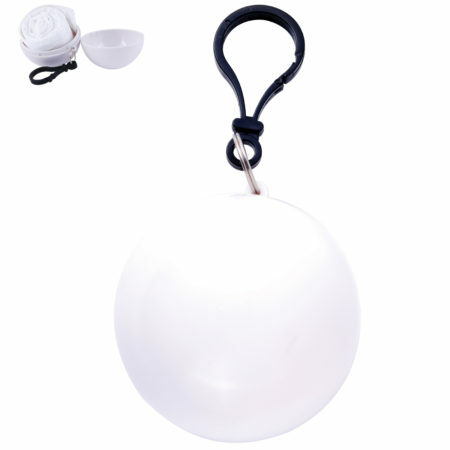 These ponchos come in a plastic ball with a carabiner attachment which means they are good to clip onto keys or belt loops when going for a hike or going out fishing. Brand Republic also stock a branded Emergency Raincoat which is a great option for lifestyle and adventure stores to brand and stock to be purchased. These raincoats come with a hood and are packaged in a polybag for easy storage. With a 100mm x 70mm digitally printed label on the polybag, these raincoats are a cost effective promotional product that you won’t have trouble selling. Branded ponchos and raincoats are great for marketing and promoting your brand, organisation or event. Ponchos are a cost effective and unusual way to promote a brand, but in the right organisation or business, they can bring a great deal of awareness to your brand. You can order your branded ponchos online today, or if you prefer to have a chat with someone about your options, call Brand Republic on 03 9646 7066.